To purchase replacement parts for your dishwasher, search http://www.repairclinic.com/Shop-For-Parts using your appliance’s model number. You don’t need to clean the interior of your dishwasher if you use it regularly. If it goes un-used for a week or more and begins to mold or smell bad, you can clean it using Glisten Dishwasher Cleaner and Deodorizer. Just clean the exterior of your dishwasher with a damp sponge and a little dish detergent. Try RoVer Rust Remover to remove rust stains from the inside of your dishwasher. 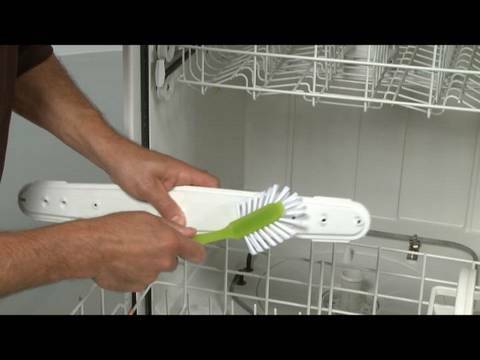 If the plastic coating wears off of the tines of the dish racks in your dishwasher, they may corrode and rust. We have repair kits available for those tines in Light Blue, Gray and White. These repair kits can be found in our Dishwasher Dishrack Parts section. On many dishwashers, there’s a filter near the bottom, or under the lower spray arm that needs to be cleaned regularly. If you have this sort of filter, check your owner’s manual to find out how to remove and clean it. If it has holes in it, replace it to protect the pump and motor seals from particles that may be in the dishwasher. Over time, the small holes in the spray arm(s) of your dishwasher may become clogged with bits of paper, toothpicks, glass, etc. Your dishwasher will do a better job of cleaning your dishes if you take a moment to clean out these small holes, from time to time.